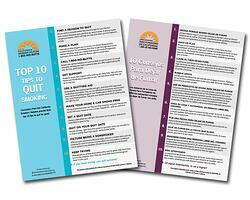 With the Great American Smokeout coming up on November 16th, now is a good time to order our popular Top 10 Tips to Quit Smoking flyer, availalble free of charge and shipping from the California Smokers' Helpline. This 2-sided flyer features qutting tips from Helpline counselors--in English on one side and Spanish on the other. So, encourage your patients and clients to make a quit attempt and provide them with our Top 10 Tips to Help Smokers Quit flyer. For smokers who need additional support, refer them to 1-800-NO-BUTTS (1-800-662-8887) or to our online registration form for free help and a plan to quit.